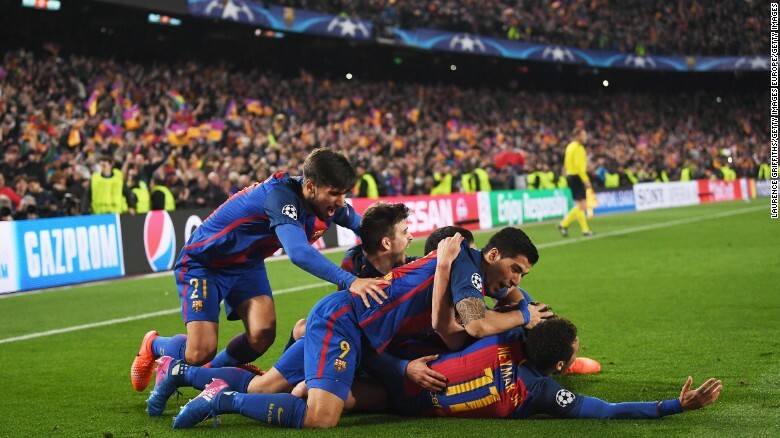 Its motto is "More than a club" and Spain's Barcelona produced more than a result Wednesday routing France's Paris Saint-Germain 6-1 to qualify for the Champions League quarterfinals, CNN reports. Having lost the first-leg 4-0 in Paris, few had given Barca a chance of reaching the last eight given no side had previously overturned such a deficit in the history of the competition. But Luis Enrique's side made a barnstorming start to the match and early in the second half a Lionel Messi penalty gave them a 3-0 lead in the Camp Nou. The home side were coasting, but just past the hour Uruguayan striker Edison Cavani's volley seemingly put PSG back in control, with Barca needing to score three more times, given the French side now had a crucial away goal. However, with two minutes of normal time remaining Neymar's exquisite free-kick gave Barca renewed hope and two goals in stoppage time completed the most incredible of comebacks. Those five minutes of stoppage time almost defy description. In the 91st minute Luis Suarez, who had given Barcelona an early lead, won a penalty, which Neymar converted. With time running out Barcelona threw everyone forward -- even their goalkeeper Marc-André ter Stegen. And almost with the last kick of the game Barca's sixth goal came from the most unlikely of sources -- not their famed strikers -- Messi, Neymar or Suarez -- but defender Sergio Roberto, who was born in Catalonia and is a product of Barca's youth academy.